Get the tone and power of Kirk Hammett of Metallica. This is the real deal”Kirk Hammett' signature stage and studio amp, not just some loaded box with his name on the front. Kirk uses this exact model in the studio and on the road with Metallica, so you know it' built to blow minds. 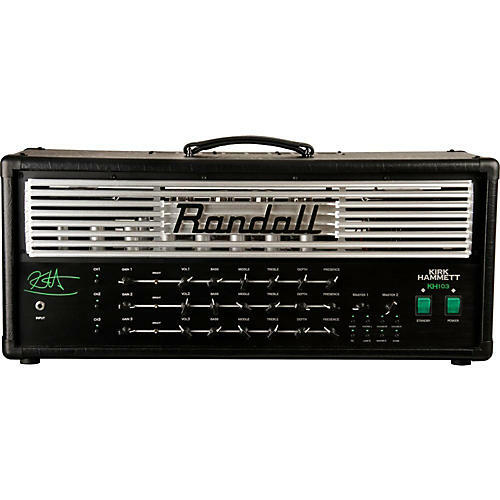 The Randall KH103 is a 120W, 3-channel, all-tube mega amplifier with 12AX7 (preamp) and 6L6 power-amp tubes. Each of the three channels feature a 3-band EQ, gain and volume controls and a 3-way bright switch for each. It also offers presence and depth controls, dual MIDI-switchable master volumes, dual MIDI-switchable series/parallel loops. And, it also has seven MIDI-assignable functions for each channel as follows: channel select, boost, Low/Medium/High gain voicing, master volume 1/2 select, Loop/Loop2 select, Store. It also incorporates individual metering and bias controls and dual side handles for easy lifting. The RF3 3-button MIDI footswitch is included.